I want to talk freely for who wants to read some stuff about the last Ludum Dare jam (spoiler: it was amazing). Who was our target audience? The Ludum Dare Jam is based on a theme voted the days before by the people. After the submission of your game, you should vote for other games made from other devs around the globe to get more visibility for your entry. The target audience for the game are actually developers! There is no any restriction of age to participate, so we had to rely on personal estimations. The feeling we had lurking on past editions was about 20–30 years old people, mostly male and of course all devs. That means that, for example, if you make a clone of Candy Crush Saga they will simply eat you publicly and threaten to burn your house. Just joking, of course (I would do the same, anyway :P). The topic of the 32nd edition was “An Unconventional Weapon”. The first goal was, then, find some great message or some great mechanic for them. Regarding session times, you will not have too much time to review each game: as I said, for each game you review you will gain more visibility. With more “coolness” factor you will receive more precious feedback and more votes. The second goal was that the game should have been fast to play and to understand in a 2 minutes session. In our case, in Sentendo (a new game development reality we are trying to build here in Barcelona) we are three professionals. Each one of us has many responsibilities at the time, anyway we use to define some role (and responsibility) for internal organization: me the producer, Kostas the programmer and Jordi the artist. We all are game designers, the role is shared between the whole team since we all are good in this field (that means that each one of us sincerely thinks that the other 2 are great game designers, and for us that’s enough). For the Ludum Dare, Jordi was not with us due to a job he has with a client, so we were in two without any artist. The third decision was the roles definition: me as asset finder and adapter and Kostas as programmer. He quickly discovered phaser.io to develop the game in HTML5. This technology is great for a challenges like that, to improve the session time in our game. You don’t have to install anything to play it, just click and play. Since there were no much time we opted to make something really neat and polished, something which people could enjoy easily and with a simple mechanic to implement. Again, you have only 72 hours to submit your game, and of course you cannot work straight all that time. We needed something with a simple and direct message, since we didn’t find a great mechanic to explore for the topic. 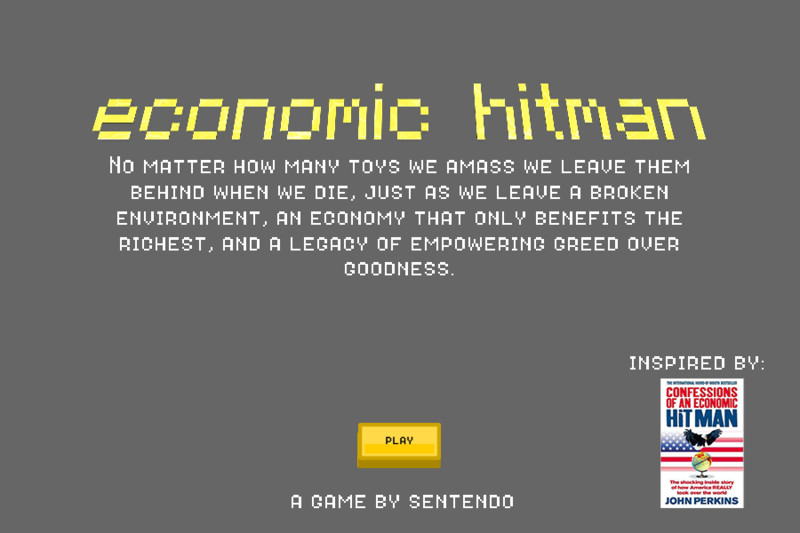 The game was based on a book called “Confessions of an Economic Hitman”. One of the arguments of this book is about the high level strategy of some corporate: they buy off their competitors just to close their companies assuring more market share for them. 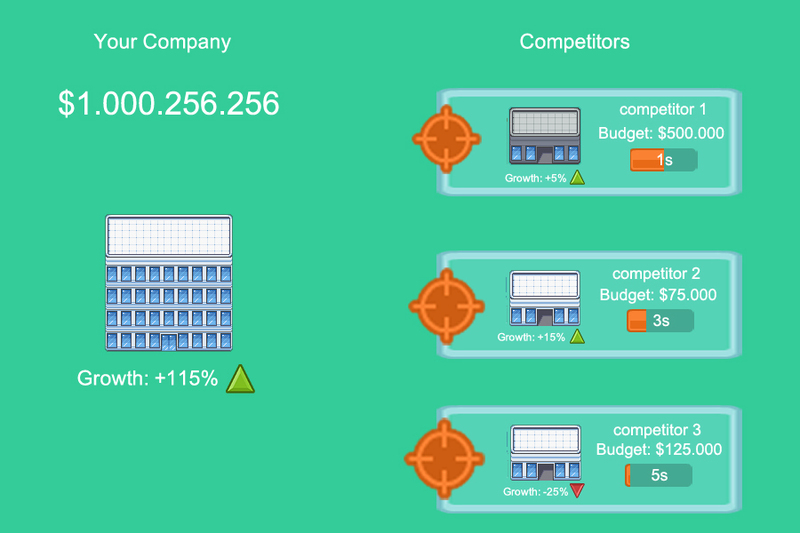 We decided to create a clicker game with a skill factor: click on your competitors to “fire” them with your cash bullets, and click on the coins they throw at you. The market share is represented from a Growth Factor that you and your competitors will have. The score will be the Budget you can amass during your play session. Players will see little people come out from the crushed companies, but they are small compared with the buildings. Another metaphor about the human role in the real context of inspiration. We wanted to make something simple, with a little deep on mechanics, but at the end we also made something difficult to balance on the fly. So the game is basically getting harder and harder and you will lose somehow. You can last more or less in the game, but you will lose. The competitors shot at you with their money to try and that will influence your growth factor. The attacks will be always more frequent and soon will become simply impossible to catch every coin coming at you. You will lose, you can try to achieve a better score, but you will lose sooner or later. That is a mistake for a skill-based game, in my opinion. The first change I would like to make to the game (and maybe I will do it) is to change the pacing to achieve the perfect balance between challenge and chance. You should last potentially forever if you are good. First of all, that was tremendously funny. I worked with a real lightness in my head and spirit. The pressure is high and the time is few, but if you know what’s the real goal, the experience is only positive. And that is to have fun, simple as that. Prove that you can make a game, even with the few resources you have. You can make a game with pen and paper if you want. No matter that we didn’t have an artist, I opened my old graphic software on my old PC and start to search for a style to give to the game. That was awesome. Plus, I discovered great qualities in my colleague, Kostas. He has a great taste for animations, for example. Even if you design a game, if you paint some awesome sprite, there is some flavour that only a programmer can put. That is really an important spot for our future together. Oh, I almost forgot, you can see the game we made here, if you want to give a peek. We are on the last run, finally. Today Kostas worked, so he started now to put again his hands to the code. I (Paolo) had the time to make some adjustments and priority changes. Everything should be in its place. Ah, I almost forgot, this will be our starting screen. Never made a logo, so I used a simple online tool. The important is the message we want to pass with this game.